How did this get on my plate or in my cup? If you have been following our blog, back in February I wrote the post “Having a connection to the things we eat and drink“. As I re-read the post I don’t think I could say it any better, except seven months later, I can honestly say that at least 80% of what you now buy at Tazza D’Oro is either local or, as in the case of our coffee, there is a direct relationship/knowledge of where the beans come from. It would be an amazing goal to reach 100%, but unfortunately that is probably not possible (I think!). BTW, I think we are also one of the largest CSA (Community Supported Agriculture) sites in the city for Penn’s Corner Farm Alliance – so I know there are a lot of locavores passing through Tazza D’Oro. 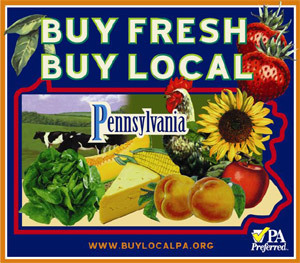 September 21st through the 27th Southwestern Pennsylvania will celebrate Local Food Week. On September 23rd from 10 am to 12 noon, please stop in Tazza D’Oro to meet Nicholas Yon from Turner Dairy and Mary Stoner, a local dairy farmer. You will have the chance to see pictures of the farm and talk with Nicholas and Mary about their commitment to provide us with exceptional milk and dairy products. For me it’s always a great experience to meet and connect with the folks who produce what I consume and to understand that I make a powerful statement everyday by where and how I spend my dollar! Beyond food and coffee we are also very committed to purchasing local services from other small, independent businesses like Bob the plumber, Ilya our web guru, Erin, Eric and Mica the painters, Roger, our fixer guy, bikes from the local shops, and countless other folks who help keep Tazza D’Oro and me running. Yeah for local foods and all of the fantastic businesses that bring us yummy stuff!